On October 24th, Food Day returned after a 34-year hiatus. The Center for Science in the Public Interest (CSPI) reinstated Food Day at this critical time in our nation’s history to “bring together Americans from all walks of life…to push for healthy, affordable food produced in a sustainable, humane way.” Hundreds of events including film screenings, lectures, discussions, neighborhood potlucks, and restaurant-hosted dinners were held in cities across the country to commemorate the occasion. To celebrate Food Day, the Harvard Food Law Society organized a full day TEDx event, which addressed modern dietary patterns and their relation to disease as well as alternative approaches for increasing supply and demand of healthy food. 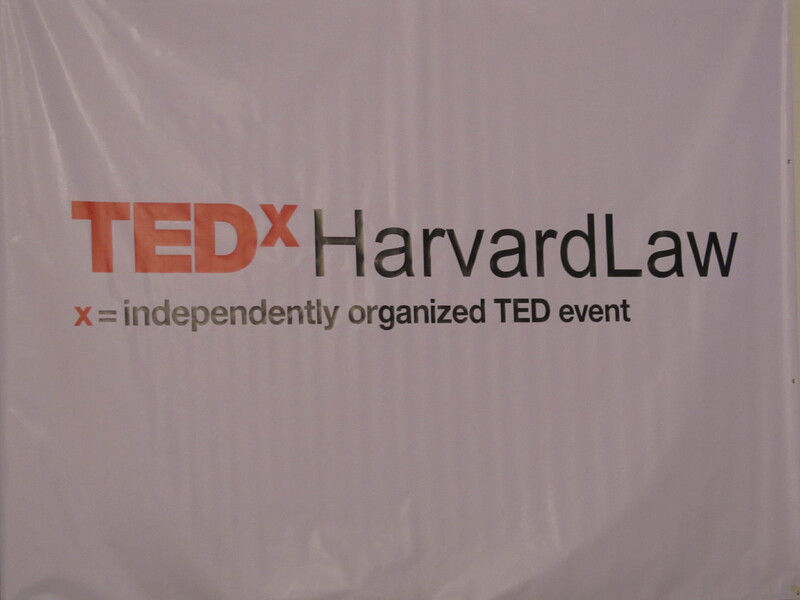 The TEDx featured experts from a variety of fields – academia, health, policy, law, retail, and marketing. “The American food supply is really a disaster,” declared Walter Willett, M.D., Dr.P.H., Chair of the Department of Nutrition at the Harvard School of Public Health and the opening speaker at the forum. Throughout the day, this sentiment was echoed by scientists, policymakers, and lawyers who presented various perspectives and solutions to this problem. The speakers discussed and debated the Farm Bill, MyPlate, taxes on sugar-sweetened beverages, banning the use of SNAP benefits to purchase soda, fructose vs. glucose, the list goes on. Many fingers pointed to added sugar as the main contributor to the obesity and health problems our nation faces. Like any good nutrition conference, things got heated at times. Although opinions differed, there seemed to be a consensus that there is a need for tighter regulations on food supply, labeling, and government nutrition programs. That is, until the last session of the day. “People don’t want to be told what to do,” according to Graceann Bennett of Ogilvy Earth. Graceanne and her colleague, Freya Williams, brought a much needed light and surprising twist to the end of an intense day. At Ogilvy Earth, the two women are dedicated to helping businesses become more sustainable. Though their focus is on mainstreaming green behaviors through creating a larger demand for them, much of what they have learned is applicable to the food and nutrition world. Setting policy is part of the equation, but it’s also necessary to create demand for healthy foods – the more people demand it, the greater the push to change the supply system. Can we create mainstream demand for good-for-you behaviors? Freya and Graceann believe we can, but we’ve been doing it all wrong. There is a large gap between what people know is good for them and what they actually do. Their latest research, “Mainstreaming Green: Moving Sustainability from Niche to Normal,” shows that when it comes to being green, 82% of people have good intentions but only 16% are actually dedicated to fulfilling them. Why the gap? For one, being green is not normal and people want to fit in. Americans believe being green is for the “Rich Elitist Snob” and the “Crunchy Granola Hippies.” Freya blames this on marketing. “Just because it’s green or good for you, doesn’t mean it has to be packaged in burlap.” By making it feel cool or different, marketers are ostracizing what they referred to as the middle greens, the people that want to fit in so they won’t follow green behaviors they believe are normal or mainstream. She argued that the same could be said for some health messages. Making good-for-you behaviors socially normal, whether that’s being green or eating a healthful diet, can help create greater demand for these behaviors. Normalizing price also helps to normalize the product. Being green can be expensive and eliminating the price barrier removes the notion that green products aren’t for normal citizens. However, the cost of being green doesn’t end with the wallet. In their research, Freya and Graceann found that those who actually engage in green behaviors felt ostracized from neighbors, family and friends. In an interview, a young woman who follows a vegan diet noted her fear of attending barbeques or other family gatherings that revolve around food. Freya and Graceann also noted that telling people something is green can be a “mood kill.” The more information people have, the guiltier they feel so they often prefer to claim ignorance. Sound familiar? Many American’s prefer ignorance when it comes to their food. If they don’t know it’s bad for them, they don’t have to feel guilty about eating it. Like the word “green,” the word “healthy” may send some running the other way. Some research has shown that if you call a snack healthy, kids don’t want it. But if you give them that same snack and tell them it’s delicious, they are more likely to eat it. So, how do we drive greater demand for good-for-you behaviors? Make it normal and try not to label it loudly. Freya and Graceann believe that keeping sustainability matters quiet may actually drive greater demand for green products. They try to avoid the “g” word; I’m thinking we should avoid the “h” word too.